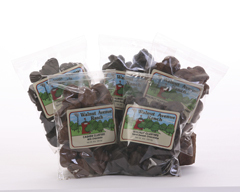 Note: we cannot ship chocolates from April thru Oct. due to hot weather..
A healthful snack rich in flavonoids and magnesium, our toasted California Nonpareil almonds are then clustered with lots of creamy milk chocolate or rich semi-sweet chocolate. Low in fat and sugar, semi-sweet chocolate almond clusters are even more healthful than the milk chocolate almond clusters. Note: We cannot ship chocolates from April thru October due to hot weather. Whole roasted jumbo cashews, clustered with milk or semi-sweet chocolate, can happily be called a health food. Cashew clusters are rich in antioxidants and good heart-healthy fats. Note: We cannot ship chocolates from April thru October due to hot weather. 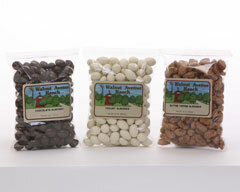 Like Rocky Road, these are clusters of fresh crisp walnuts, marshmallows, and rich, dark semi-sweet chocolate or Old Dutch milk chocolate. Note: We cannot ship chocolates from April thru October due to hot weather. Good for your health - fresh mammoth California pecans are drenched in rich semi-sweet chocolate or creamy Old Dutch milk chocolate. Note: We cannot ship chocolates from April thru October due to hot weather. Dark semi-sweet or Old Dutch milk chocolate marries fresh and crunchy California walnuts for a rich but healthful snack. Note: We cannot ship chocolates from April thru October due to hot weather.